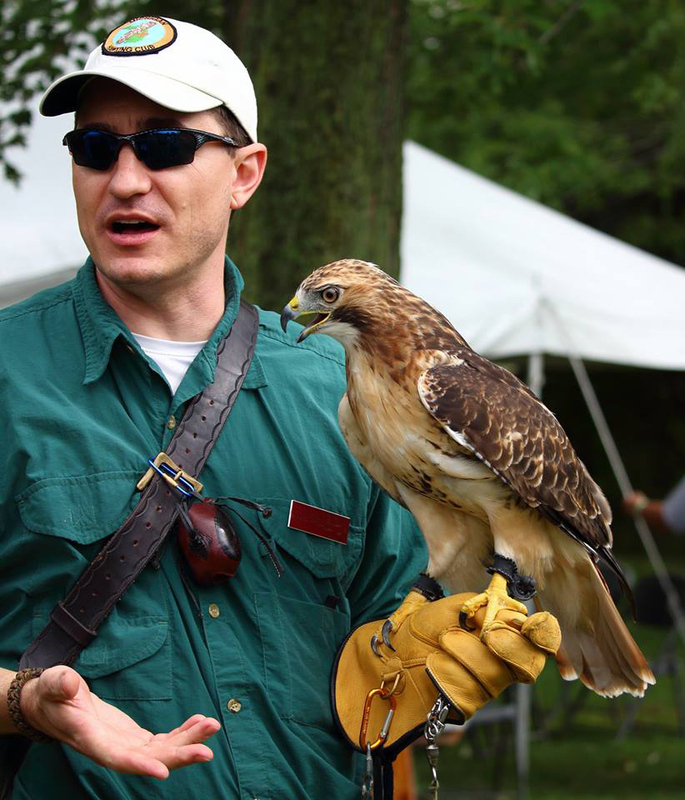 This past weekend was the annual 2015 HawkFest at Lake Erie MetroPark in Brownstown Township, Michigan. This annual event celebrates the migration of raptors from Canada as they cross the ‘land-bridge’ from Ontario to Michigan and continue their way to their winter resting grounds. If the migration is timed correctly, and the weather is good, the migration of hundreds of thousands of hawks can be observed. The weather this past Saturday was not the greatest for bird watching, raptor migrations, or outdoor nature events, but after the front cleared out the humidity and the rain, the afternoon turned out to be an enjoyable Saturday afternoon. 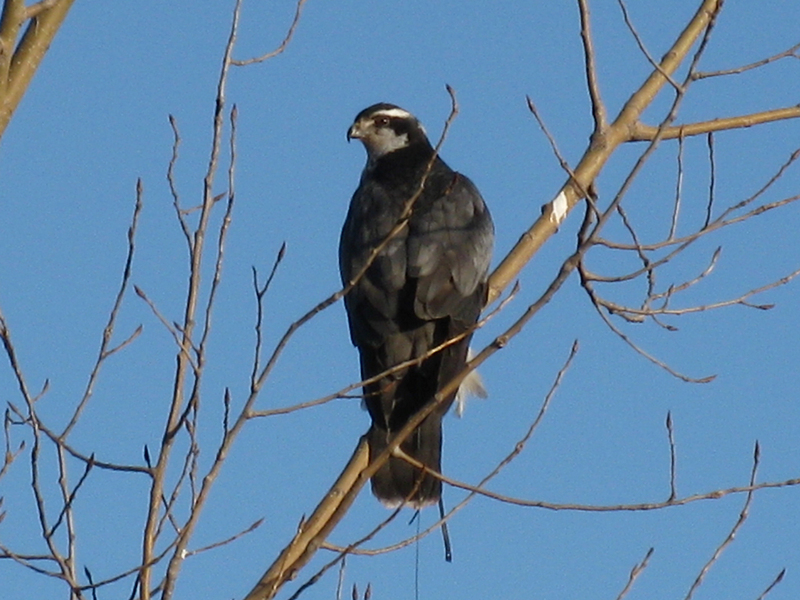 The hawk flights picked up in the afternoon and raptors could be observed readily in the afternoon hours. Several Osprey, Bald Eagles, and smaller accipiters could be observed from the main viewing area. A small kettle of Broad-Winged Hawks formed over the nature center for a few brief minutes as nature enthusiasts looked on with binoculars. A few club members, including myself spent time out in the trapping/banding blind catching Coopers Hawks and Sharp-shinned Hawks. Each year, licensed bird banders trap, band, and collect measurements on the migrating raptors that traverse across the river to keep moving on from their northern territory. The biggest migrating hawk by the numbers is the Broad-Winged Hawk. Members of the Michigan Hawking Club an other local nature organizations come to the HawkFest to share their love of raptors with others and enjoy all of nature’s gifts. In addition, many members of the Michigan Hawking Club donate their time and expertise in Falconry to come to the event for the day to provide Hawk Talks to HawkFest attendees. The picture below, taken by Krystal Hoag shows Cedar and myself presenting falconry lore to a few of the onlookers attending the event this past Saturday. 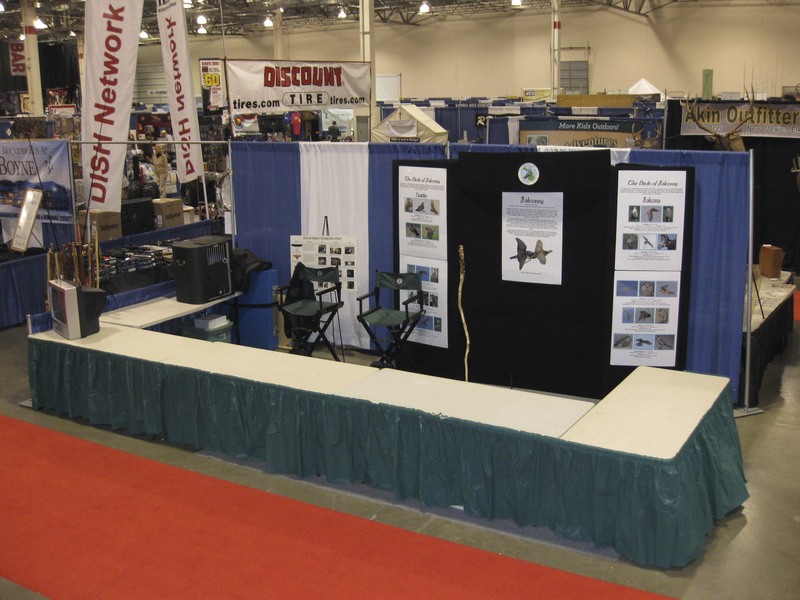 There were many folks who took in the celebration of raptor migration and on Sunday the Club Booth was well attended. This is one of the tenants of the Michigan Hawking Club, to provide educational programs and ‘HawkTalks’ to interested attendees. 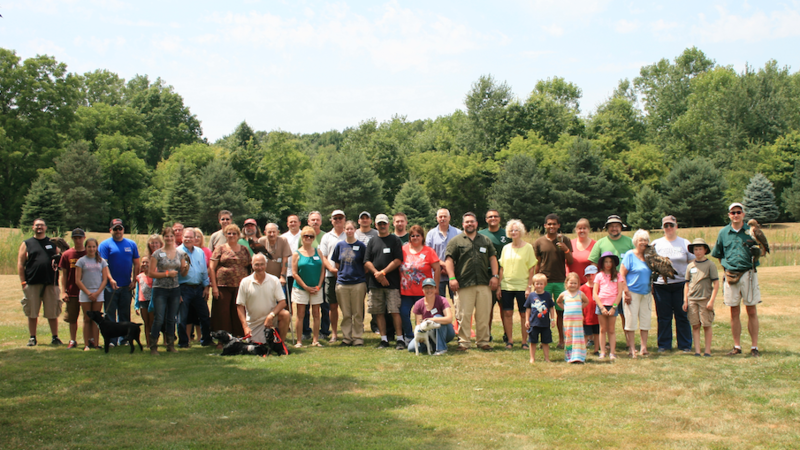 The Michigan Hawking Club holds it’s annual picnic in the summer as a way of keeping our community together during the non-hunting months of the summer. The picnic is a great time to catch up with falconry friends and talk ‘hawk’ all afternoon. Our picnic hosts have lots of help to put on this event and the club membership is always grateful for their hospitality. One of the best MHC Events during the summer (off hunting season) that falconry can offer is the Apprentice workshop that the MHC puts on for aspiring falconers. This the best event for young falconers to get to know members of the club, discuss finer topics of falconry, as well as get some hand’s on experience with making equipment. 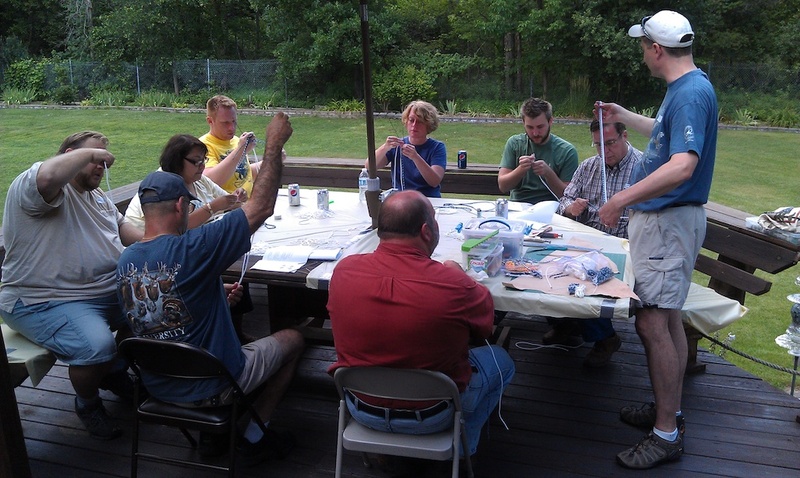 This is a workshop that the experienced club members put on for new, upcoming falconers to learn more about the details and particulars of this fine sport. The schedule created for the event is designed to cover the wide range of topics is a full one and takes a full day to complete. While a one-day course taught by experienced falconers is not quite a comprehensive orientation, it is a good start by which someone can make some intelligent decision making about continuing to persue the sport. * Photography credits to Deborah O.
Here’s the booth from the Outdoorama expo this past month. The expo was less attended this year due to the inclement weather on Friday. It snowed considerably during the course of the day and the turnout at the show was light. Sable was not in attendance with me today, but I was able to share my falconry experiences with others and share some hawking stories with the falconry folks. This event is a big personal favorite of mine for several reasons. The Outdoorama expo was my first interaction with raptors and the Michigan Hawking Club. I am always excited to share my falconry experiences with others and share my enthusiasm of hawks, falcons, and owls. This past weekend was the yearly Michigan Hawking Club Field Meet. This is the only meet in Michigan that is open to the public where folks can come in and go out hawking with experienced falconers and their birds. It is also a big day for fundraising for the club each year with the silent auction of falconry items and then after the dinner, the live auction. Many folks from all over donate items to the club specifically for the auctions. Artwork, falconry equipment, and several other types of outdoors and hunting items. I was looking forward to flying my PFRT* “Sable” in the meet but she had been sidelined earlier this year due to some injuries sustained while hunting. Regardless of not having a bird to fly, I was determined to enjoy a great day of falconry with some wonderful falconers and some exciting birds. The weather was unusually warm for a field meet in the early part of February. It was 45º F and sunny. A great day, perfect weather for falconers, not necessarily perfect weather for hawking, hunting, or rabbits. Last year at this time, the Lansing area had about 26 inches of snow and it was tough walking. The cold and the wind made it difficult for walking and the birds had some troubles with flights. So the weather was vastly different from a year ago and I believe, was a contributing factor to the successful hunting that I was witness to. In the morning, we were sitting around enjoying some coffee and bagels until it was time to go hunting with a small group of folks. We went out with Falconer Dave and his PFRT* “Bandit.” Bandit has been doing very well on rabbits this year and the field meet was another good exercise for her in the field with an extra set of brush beaters. Bandit got three chances at rabbits in this small field that was thawing out quickly in the sunlight. The rabbits had extra traction today without the snow, so on the last flight, all Bandit got was the tail. At least Dave had a small trophy to take home for the day. 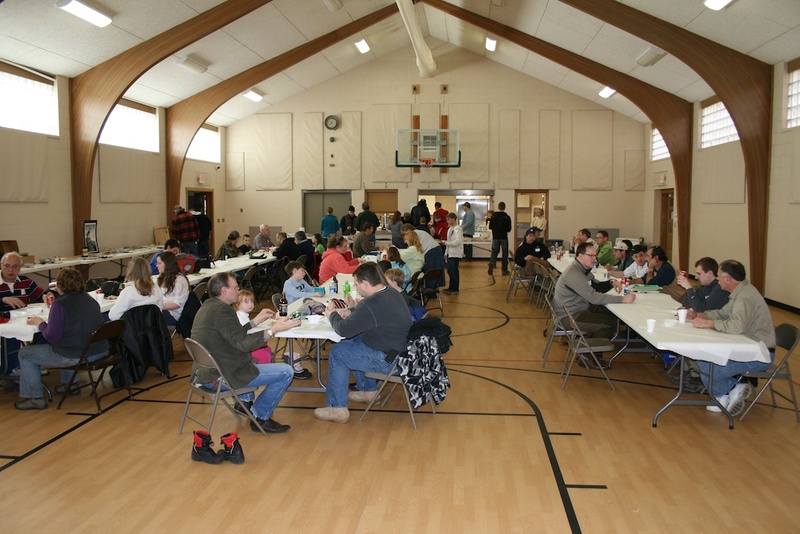 After a good morning of hawking with Dave and Bandit the brush-beater crew was getting hungry so we decided to make it back to the community center (meet hub) for some refreshments. The second hunt took place after lunch. With some good food consumed and excitement for hunting, I grouped up with Falconer Sue and a few other folks to go out to another hunting spot. There are some days when I don’t mind being the excursion leader, but being put on the spot to lead folks to a hunting area that I’ve been to once makes me a little nervous. With a very chatty passenger, I had some difficulty keeping track of how to arrive at my destination and I inadvertently led a caravan on an extended detour along I-96 north of Lansing. In any event, we arrived at the spot a little late and got the hunting crew all suited up for a good squirrel chase. “Indie,” Sues PFRT* was first out of the box, she was ready for hunting today and has had lots of practice at squirrels. She had two squirrels going about 60 feet up in this tree. The first one was caught by Indie right away, but the hawk had the squirrel between the crook of a branch and couldn’t get down, so Indie let the squirrel go, and the chase was on. The squirrel bailed down a branch and the hawk missed on the second attempt. As the squirrel made its way down the branch, it disappeared into a hole in the tree and the chase was over. A second Squirrel appeared after Indie saw it and that squirrel, too, made it’s way into the same hole in the tree where the other squirrel went. Great, now there are two squirrels that Indie can’t get to. By this time the brush-beater crew is all hacking at branches and making general racket to excite the squirrels. A third squirrel was still sitting motionless in the very top of another tree. This little critter was about 80 feet up and hadn’t been spotted by Indie yet. The noise level started making the squirrel nervous, so he twitched just right and Indie was hot on her tail. The squirrel bailed out, down the tree and nearly landed directly on my head. I saw the squirrel land on the ground just three feet away, and immediately Indie was on the squirrel. I stuck my hand in to hold the head and Indie had no injuries or bites. Indie was traded off the squirrel without an issue. The hunting crew today consisted of some VIP’s and a family, and they were treated to a first rate falconry experience thanks to Sue and Indie. Our third adventure took us away from the Lansing area up to St. Johns where we joined Jeff and another brush-beater crew already in progress. Jeff’s 1xFRT** was on fire in the afternoon with one fresh rabbit in the bag. Every ten steps that the beating crew walked put out another rabbit. 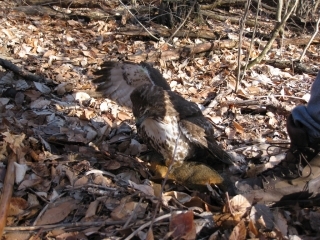 After several flushes, the hawk connected on a cottontail and was traded off. Another two rabbits flushed and the hawk got it’s third cottontail on the day. The flights were quick and the hawk was fast enough, but it was very exciting to watch the hawk go after another rabbit and keep up with the large crew. If you hunt often, having your hawk catch one rabbit is a great thing; you feel like an accomplished falconer for the day and you feel good that your hawk caught something worthwhile. 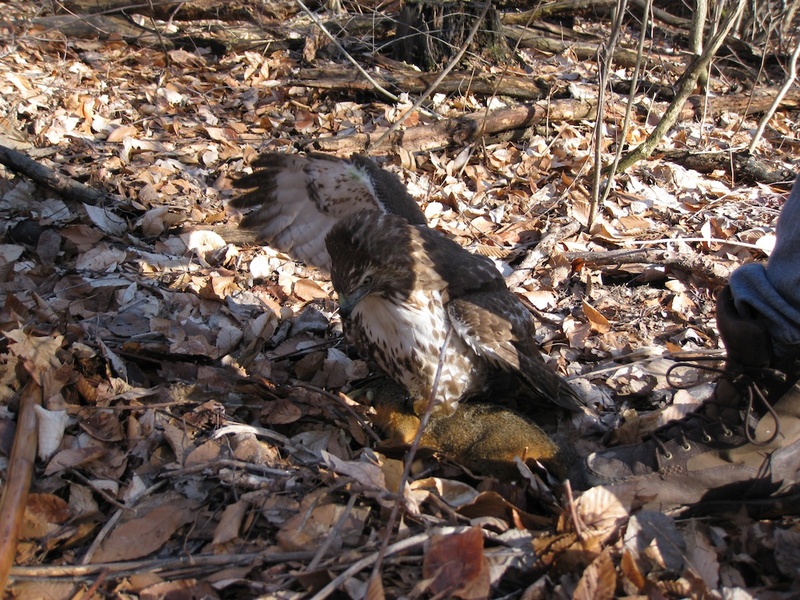 If you are lucky enough to have your rabbit hawk catch two rabbits for a single hunt, not only are you doing well, and you have a great hunting spot; you are having a banner day with your hawk! This would be cause for lots of pictures and a great celebration at the end of the day. I’d be talking about it for weeks! Three rabbits in a single hunting afternoon with the same bird is practically unheard of! 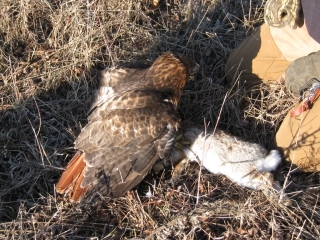 The hunt ended with three rabbits in the bag for Jeff’s hawk with a very excited hunting crew ready for more! With daylight dwindling down and the fatigue from the day catching up to us, it was time for one last hunt with a goshawk. Falconer Dave got out “Spike” and brought him out to the field. I’ve been attending field meets for about five years now and this was an event that I had eagerly anticipated; watching a goshawk flight after rabbits. Knowing the temperamental nature of Goshawks, this hunt was going to go one way or the other; really good or it would be a bust. Spike flew up into a tree in a central location in the field while the brush-beating crew walked around looking to kick out rabbits from the brush. It took us a while before we were able to get a few going, and the rabbits seemed like they were popping out everywhere. The goshawk had a decent perch with a good view of the landscape, but just didn’t give chase to any bunnies. At one point, while waiting for the bird to see if it would take off, I stood still for a moment, catching the sunset as the sun lowered into the horizon. It was good to take in the moment and enjoy the light as it scattered rays of sun in all directions through the clouds. Then I took a step and GAAAAAAAAHHHH!!! A rabbit had been sitting still right under me and the next step he decided to bust out of that cover and shot behind me in the opposite direction of the Goshawk. That was a hunting ‘first’ for me, actually stepping on a rabbit to make him flush. That goshawk never did give chase to a bunny, and even appeared to turn up it’s beak at the quality flushes that that the brush-beating crew put out for him. Sadly, it was a disappointing goshawk hunt, but it was still enjoyable to be in the company of some great folks. There were some falconers lamenting the fact that there was no snow and that the temperatures were warm. It was overheard from more than one falconer that they saw a Gardner Snake in the field. A Gardner Snake sunning itself out in February??? What’s up with that? I for one, witnessed a great deal of excellent hawking today and enjoyed the weather. The two feet of snow from last year was impossible to walk through without the assistance of snowshoes. But the warmer weather has it’s drawbacks too; for instance in one hunting place, the field had been plowed under by farm equipment, and the water had not drained off yet, making about 6 inches of mud to slog through with a decent pair of boots. Once the boots get covered in mud and weighted down, there is not much difference than trudging through two feet of snow. The only thing that would have made my day better was if I could have flown my hawk “Sable” out today and her be successful on some game. That would have been the only way to make the day better, but I sure had a great full day of falconry. I’m looking forward to next year already!